O’Donnellan & Joyce auctioneers will launch its Wild Atlantic Way April 18 property auction on Thursday next, March 21. The cut off date to register a property in this auction is set for Tuesday March 19. This will be the second in the company's Wild Atlantic Way auction series for 2019. Following the record sales achieved in its recent auction where more than €6 million worth of properties was sold, with a 100 per cent success rate achieved for Galway city properties. The April auction promises to be even bigger and better with a wider selection of properties already registered along the Wild Atlantic Way, and this is potentially the largest auction to be held by O’Donnellan & Joyce. As always the auction will take place in the Harbour Hotel, New Dock Road, Galway, and is set for Holy Thursday. Viewings will commence on Saturday March 23 and viewing times for each property will be listed online on www.odonnjoyce.com and in local press. 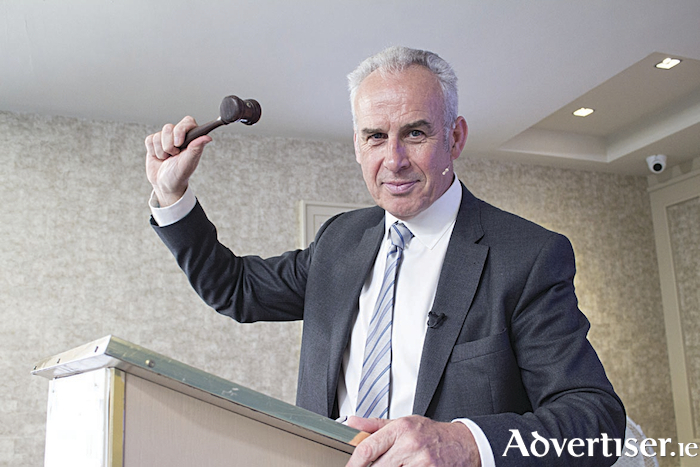 O’Donnellan & Joyce auctioneers' Wild Atlantic Way auctions are the largest live auctions in the country, where bidders can attend in person in the Harbour Hotel, or can bid online or on the phone from anywhere in the world. O’Donnellan & Joyce’s auctions are streamed live online by Brandt Studios, and the March auction was followed by a record number of viewers with more than 20,000 people tuning in. Colm O’Donnellan of O’Donnellan & Joyce said: “As spring arrives, more and more properties come on the market and the April 18 auction promises to have something for everyone — investors, first time buyers, and families trading up." Three bedroom family residence located in Shantalla, superbly positioned just 20 minutes' walk from Shop Street in Galway city centre. Situated c1km from UHG and 1.5km from NUIG, this property would make a lovely family home with suitable renovations to upgrade the property. Semidetached five bedroom home that requires full refurbishment, situated in a quiet cul-de-sac in a mature neighbourhood. Salthill amenities include the Promenade, diving tower, a host of popular cafes and restaurants, as well as quality primary and secondary schools. Devon Park is also within walking distance of Galway city centre, with popular landmarks such as Galway's West End and Latin Quarter within easy reach. A wonderful four bedroom end of terrace private residence located at Rosan Glas, Rahoon Road, on the west side of the city. Rosan Glas is a beautiful development of homes which overlook manicured green areas and stunning landscaping. Presented and maintained in excellent condition throughout with careful attention to details and decor, the accommodation is both bright and spacious and is spread over three storeys. Ideally located on the doorstep of NUIG and UHG, this home is also conveniently close to Galway city centre, Westside Shopping Centre and playing fields, and Aldi supermarket. There is also an excellent bus route to and from Galway city centre. This is a four bedroom detached house with space in abundance. Detached four bedroom property currently operating as a B&B on College Road. This property has the potential to be a lovely family home or a great business opportunity, just strolling distance from Galway’s coach and rail stations and the main shopping district. The Connacht Rugby grounds are less than three minutes’ walk away and it’s only a stone’s throw from Eyre Square. This property is located on an elevated site with panoramic views of Galway Bay across to the Aran Islands from the conservatory. This four bed detached bungalow is on a large site of c0.29 hectare (0.71 acre ) and is just five minutes’ walk from main Galway road (R336 ). Semidetached four bedroom home, located opposite the entrance to the NUI Galway School of Economics, this property is only 10 minutes’ walk to UHG. Other local amenities include a gym and swimming pool at the Kingfisher Club at NUIG, and the wooded trails on the banks of the River Corrib. Westside Shopping centre is four minutes' drive away and Galway city centre is just five minutes. Situated just outside Galway city centre, this is a detached residence on a substantial site, in a popular and established neighbourhood offering all the benefits of city living. Fr Griffin Road is close to several primary and secondary schools, and within walking distance of Salthill Promenade and Galway's city centre. Perfectly appealing as an investment property, this would also be a delightful home for a family looking for a slice of city living. This cottage style bungalow on c1.76ha (4.35 acres ) is situated on Rosshill Road in Roscam comes with foreshore of approximately 0.33ha (0.81 acre ) nearby. The property enjoys breathtaking and unobstructed views of Galway Bay and considerable frontage on to the foreshore. A delightful three bed family home in mint condition, located on the Cappagh Road, Knocknacarra, which is surrounded by recreational amenities such as Cappagh Park and sports centre, football pitches, and running tracks which lead into Barna Woods, making it ideal for those who enjoy outdoor pursuits. The property is also a leisurely stroll to Silverstrand and Barna village. Ideally suited for first time buyers as it has been entirely refurbished and modernised. Three bedroom mid-terrace property in exceptional condition, located in a popular residential area. This property would be a perfect first time buyer’s home due to its close proximity to NUIG and UHG, or an excellent investment opportunity. In terms of convenience, the estate is located on an excellent road and bus network bringing all amenities within easy reach. Mid-terrace residence with three bedrooms, overlooking a large green area. This property is very attractively priced and offers all the excellent facilities of Tuam on its doorstep and is just off the new motorway (M18 ) which connects Galway city. Two bedroom first floor apartment with car parking space, offering spacious internal accommodation and balconies with breathtaking views overlooking Salthill Promenade and Galway Bay. Both Galway city centre and Salthill village are just a short stroll away. The full auction catalogue for the Wild Atlantic Way April auction will be available online from Thursday March 21 and open viewings will commence on March 23. For further information contact O’Donnellan & Joyce auctioneers, 5 Mary Street, Galway, on 091 564 212, www.odonnjoyce.com, or email [email protected] .